Fur Trappers and Traders. French frontiersmen often carried the name of coureurs de bois (forest runners) or voyageurs (canoeists or travelers) and were the earliest representatives of their homeland in North America. The beaver pelt became the prime focus of their activities. The demand in Europe was enormous because the furs provided the wearer with protection against the elements as well as a mark of social distinction. The reduction of the beaver population forced the trappers and traders to push deeper into the interior in search of their prey. The initial French ventures in North America were fur trading companies, but few of these prospered. In 1663, the French crown took direct control of all activities in New France by substituting royal control for corporate. The interaction between the French fur trade and the native inhabitants of the area was fundamental. The whites traded European manufactured items in return for animal skins; firearms and brandy were highly prized. This exchange angered another French presence, the missionaries, who objected strenuously to the introduction of alcohol into Indian society. Relations between the traders and Indians were generally peaceful as long as trade was conducted fairly. A strong and lasting bond was formed between the French and the Algonquian, but Samuel de Champlain's military assistance against the Iroquois sparked enduring enmity. Unlike the English settlements, the sparse French communities did not exert great population pressure on native hunting grounds, which averted a potential source of friction. Fishermen. French fishermen were among the earliest Europeans to exploit the riches of the Grand Banks, which resulted in small seasonal settlements in coastal areas of Newfoundland and Acadia (Nova Scotia), but few of these seafarers ventured very far inland. The French fishing activities were important to the nation's economy and the rights to fishing grounds were vigorously contested among the major world powers. Missionaries. The French missionaries, particularly the Jesuits, made sincere efforts to take Christianity to the native population. Their efforts were often met with indifference and sometimes with brutal hostility; the accounts of the torture and execution of a number of the priests are truly harrowing. The missionaries became adversaries of the fur traders. French brandy was often the base of trade with the Indians, but the priests argued that inebriated natives were unlikely candidates for conversion to Christianity. The Jesuits lobbied hard in France to restrict the traders' activities, but were generally unsuccessful. The fur interests argued successfully that if French alcohol were banned, it would be replaced by rum manufactured in the British colonies. Permanent Settlers. The number of Frenchmen who elected to move to New France was never large. Few were willing to exchange the mild climate of their homeland for the harsh winters and poor soil of Canada. Enthusiastic French officials enticed settlers by giving cash payments to those willing to relocate. Once situated in New France, the colonists were encouraged to increase their population. Shiploads of marriageable women were dispatched, bounties were paid for large families and fines were imposed on fathers of daughters who were unmarried past age 15. Several factors worked against the success of French colonization in North America. The Huguenots , religious dissenters at home, were forbidden to settle in New France. Following revocation of the Edict of Nantes in 1685, many French Protestants immigrated to South Carolina, New York and Massachusetts. This exclusionary policy marked a sharp contrast with the English colonies, where ambitious religious malcontents fueled the growth of many communities. The French also insisted on attempting to transplant elements of feudalism, 1 a form of social organization then in steep decline in Europe. Huge manorial estates were established in desirable locations for favorites of the crown, while the common settlers were little better than serfs who were required to pay annual dues or rents for their use of the land. The system offered little incentive to people seeking to improve their lot in life. Despite its drawbacks, the highly organized society of New France offered one decided advantage  the relative ease of mobilization during time of war. The French maintained a standing army in the colony, which relieved the need to call upon the settlers for service. 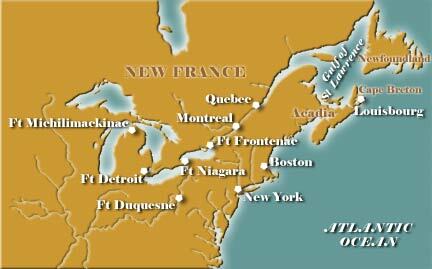 Further, French society in North America was a single unit with one governor in complete control. The English colonies, by contrast, rarely could achieve agreement on any matter. Residents of one colony showed interest in supporting military action only if the threat were on their doorstep. By the late 17th century, a great rivalry had developed between France and Britain. Over a period of roughly 70 years, four major wars would be fought between these powers. As time passed, the importance of colonies, North America in particular, grew in importance. The final round in this struggle, the French and Indian War , spelled the end of New France. l. Feudalism was a political, social and economic system that dominated much of Europe after the 800s. The basic relationship was between a noble, who owned or controlled the land and provided protection, and the vassal, who owed services (often military) and dues to the lord. The Dutch in the New Netherland implemented a manorial system as evidenced by the huge estates that dominated the banks of the upper Hudson River. The proprietors of South Carolina attempted to impose a feudal system in their domain, but failed. American Colonies: The Settling of North America by Alan Taylor. Crucible of War: The Seven Years' War and the Fate of Empire in British North America, 1754-1766 by Fred Anderson. Champlain's Dream by David Hackett Fischer. A Few Acres Of Snow: The Saga Of The French And Indian Wars by Robert Leckie.